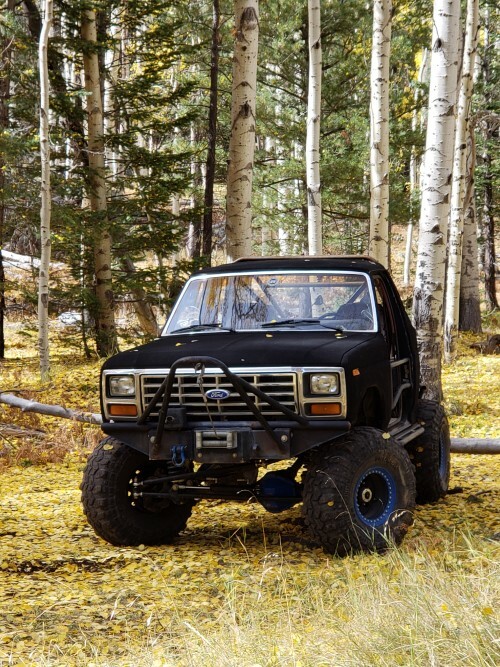 Ford Bronco Forum > Welcome > F.O.T.M Voting > FSB of the Month Winners > Congratulations to cstrike your FOTY 2018 Winner !!!!! BikerPepe`, NAMELESS, miesk5 and 6 others like this. BikerPepe`, Ghosteh and Quader1 like this. Good job @cstrike ! Well deserved and congratulations! Awesome custom Bronco! @Ghosteh you have one cool rig. I can appreciate what you are doing - I dig it. Ghosteh and Quader1 like this. Congratulations on your win. What a cool looking ride. Congratulations @cstrike ! You have a monster of a rig that is very cool, & you made the competition a lot of fun! Good luck & we're all looking forward to your 3rd Bronco! BikerPepe`, anaconda, Quader1 and 1 others like this. Well well well..... this is one for the books!! @cstrike , Not only do you have an awesome rig, I had the honor of actually wheeling it!!! It was me that nominated you back in January, and I thought you would have a great chance at winning the FOTM to bring you to FOTY! That is one cool truck that amazed me on the honeymoon run!! @Ghosteh , dude...... Your story is a story that is truly UNBELIEVABLE. I'm in love with the story, the truck and what you've done to bring it back to where it is now. Really sounds like a fairy tale, but we know that you got what was once your truck!! You've got the pictures to prove!!! You deserved the win just as well, there's no doubt. It was a very close race all the way to the end! You, @Ghosteh , worked hard, and the journey was well deserved for my vote!! Don't let the story end here!!! But there can only be one FOTY!!! Phil!! By the way, LOVED the Santa Hat videos!!! LOL!! Bring on the 2019 banner!!! Ghosteh, Quader1 and MS88Bronc like this. BikerPepe`, anaconda, Ghosteh and 2 others like this. Great competition and congrats to cstrike. The stories were great and kept me up till midnight reading thru the entire thread from start to end. Well done gentlemen. cstrike, Ghosteh and Quader1 like this. cstrike, Ghosteh, Quader1 and 1 others like this. anaconda, sackman9975, cstrike and 3 others like this. I will just say DITTO to all comments, great competition! Congrats cstrike on the Win. Congrats cstrike! One of my favorites around here. cstrike and Quader1 like this. Congrats Cstrike!! Outstanding effort to the competition and a great rig, a well deserved win! Nice! I am still lurking around in a dark corner somewhere LOL, glad to see a dedicated member reap the rewards of your labor. How does the song go? Back in the Saddle again, only here on FSB the version is Back on the Banner again! Only this time it's with a different rig. But hey it will feel right at home just like the first one did. Not sure if anybody has ever won twice with different Broncos but my concern is geniune when I quote my signature; Welcome to the addiction where the first step is admitting the problem is you and the cure is your BRONCO.....Dude You truly have the GOOD STUFF and the addiction is a passionate one because your cure requires 2 BRONCOS! I for one would be curious to see if a third Bronco would cure you? Last edited by itwasFREE!!!! ; 12-20-2018 at 03:26 PM. Just to let you guys know what a class act @cstrike is: He was already a lifetime member from his first FOTY win, so he gave me the lifetime membership that he won this time around... but only on the condition that I stay active & keep posting updates about my Bronco. Deeply appreciated & challenge accepted!